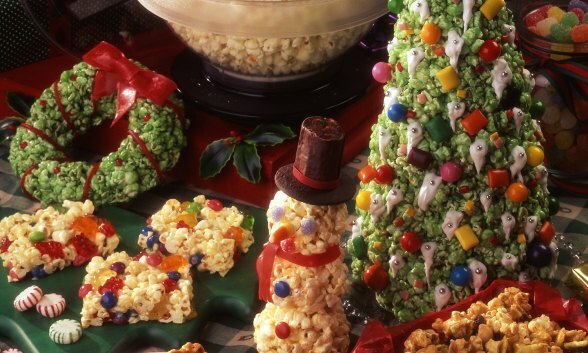 For something unique during the holiday season, try your hand at popcorn sculpting. This Christmas tree, wreath, and snowman are fun to make and the finished sculptures can be eaten or displayed for holiday entertaining. Using a Presto® popcorn popper, prepare popcorn as directed, removing any unpopped kernels. Measure 8 quarts popped corn: divide into two large bowls, set aside. Spray a large baking sheet with cooking spray, set aside. In saucepan, over medium heat, combine sugar, corn syrup, salt, and food color. Cook, stirring constantly, until sugar melts and mixture comes to a full boil. Immediately pour equal amounts of syrup over popcorn in each bowl. Working carefully and quickly, toss popcorn with wooden spoon until well coated. With greased hands press all popcorn firmly around an empty paper towel roll, making a tree shape. Once desired shape is achieved, decorate tree with gum and candies, firmly pressing into tree. Squeeze icing onto tree to simulate snow and press silver dragees into “snow”. Place star on top of tree. Makes one 10-inch tree. Using a Presto® popcorn popper, prepare popcorn as directed, removing any kernels. Measure 2 quarts popped corn into a large bowl, set aside. Spray a large baking sheet with cooking spray, set aside. In saucepan, over medium heat, combine sugar, corn syrup, salt, and food color. Cook stirring constantly, until sugar melts and mixture comes to a full boil. Immediately pour over popcorn. Working carefully and quickly, toss popcorn with wooden spoon until well coated. Use greased hands when shaping into sculptures. Shape basic sculpting mixture into balls to create snowmen (finished size approximately 7 inches high). Mix powdered sugar with enough water to form a thick paste. Use paste to attach candies and cookie to snowmen. Place chocolate cookie on top of snowman’s head as brim of hat. Cut one end of a “Ho Hos” brand snack cake to the desired height of top hat; attach to center of chocolate cookie. Cut gumdrops into fourths, attach as eyes. Paste candy corn on as nose. Cut “Fruit by the Foot” fruit flavored snack in half lengthwise to desired length for scarf. Use kitchen shears to fringe the ends of the scarf. Attach “M & M’s” brand chocolate candies to body of snowman as buttons. Cut “Fruit by the Foot” fruit flavored snack into a small band to be used around the top hat. Secure with paste mixture. Divide basic sculpting mixture in half. Shape each half into a wreath. Wrap licorice around wreath about every 2 to 3 inches. Decorate wreath with Red Hots. Form licorice or “Fruit by the Foot” fruit flavored snack into a ribbon and press onto wreath. “Orville Redenbacher’s® and Gourmet®” are registered trademarks of ConAgra Foods RDM, Inc.
“Fruit by the Foot” is a registered trademark of General Mills, Inc.
“M&M’s” is a registered trademark of Mars, Inc.
“Ho Hos” is a registered trademark of Hostess Brands, Inc.